In Urban Meyers book Above the Line, Meyer dedicates a chapter to Creating a Culture. The subtitle is Leaders Create Culture. Culture Drives Behavior, Behavior Produces Results. The subtitle alone might surprise many A-type personalities who are all about performance, who seldom recognize the value culture has on influencing a business’s performance. 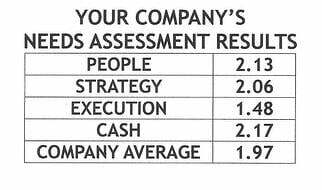 Based on this definition, how would your grade your business culture? If culture determines attitude and effort, what is the attitude and effort of your team telling you? Meyer’s definition of Above the Line behavior could easily be an annual theme or a purpose for any business. The performance of a team rises or falls on behavior. Winning behavior is intentional, on purpose and skillful. It is Above the Line. But it’s easier to be impulsive, on autopilot and resistant. This is Below the Line. Below the Line is dangerous, because it is comfortable and convenient. It is the path of least resistance. Above the Line behavior is conscious and thoughtful – a choice made in alignment with your larger vision or where you want to go. Below the Line behavior is directed by impulse or the gravitational pull of old habits; you just react without thinking. Below the Line is your default response. It isn’t hard to find people who are caught up in Below the Line behavior. All you need to do is look for those whose first reaction is to blame (others), complain (about circumstances), and defend (yourself) or BCD. 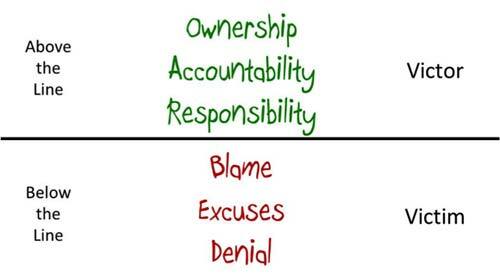 Ask yourself this question: Is your team quick to blame, complain or defend themselves? If they are, then certainly they are acting irresponsibly, and by Meyer’s definition, Below the Line. A quick guess. If your team is in BCD mode, your culture is not driving winning results. You need to change. You need to adopt an Above the Line culture and weed out the members unwilling to believe, behave, and experience the culture you’re coaching. 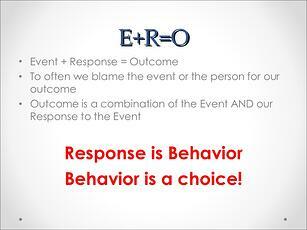 Meyer believes we don’t control the events in life and we don’t directly control the outcomes. But we always have control over how we choose to respond. Big Es and Big Os require Big Rs. Adjust & Adapt – Consider current path of your R Factor habits. Where are they taking you? Where do you want to go? Adjust. Build Skill – Elite performers build skill above their talents. Talent is a gift, greatness is a choice. Under pressure, we do not rise to the occasion. We rise or fall to the level of our training. In football, when contact is made, it is too late to train and build skill. We must prepare and develop our R Factor capacity before we experience challenging situations. Under pressure, the R Factor habits that will be available to you are the ones you have purposefully built into your life. Exceptional performance is the result of an uncommon level of focus and discipline in the pursuit of greatness. Meyer isn’t the first to say, “Culture Eats Strategy for Lunch.” Management guru, Peter Drucker said, "Culture Eats Strategy for Breakfast." Curt Coffman and Kathie Sorensen wrote a book by this title, Culture Eats Strategy for Lunch: The Secret of Extraordinary Results, Igniting the Passion Within. Looking for help building a dynamic and performance oriented culture in your business? We have the tools and resources to, “make it so!” Contact dwick@positioningsystems.com for help. One of my favorite sources for customer service, is John Dijulius. We consistently reinforce the significance of customer and employee feedback, recommending tools like Net Promoter Score (NPS), and employee engagement Q12, and most recently the employee Net Promoter Score (eNPS). Your most highly satisfied customers share positive information about your product and services, without being asked or paid to do so. These Brand Advocates influence 20-50% of all purchases. Who are they and how you can leverage these advocates of your business is our next blog.